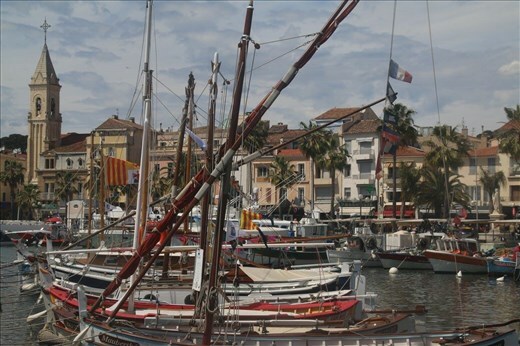 The third day, the ship went to a seaside village, called sanary ser mer. This was a tender port, so we had to take tenders to the shore. As customary with the ship, since there we're only 200 people, the wait for the tender was only about 15 minutes. Which was nice. There was a farmers market set up in town. I have been on many cruises, and often times vendors we're present to sell knik-knaks, postcards, and little made-in-China souviniers. Not this time, this was a real authentic market, with real beautiful olives, cheeses, fruits-and they locals we're shopping. It was veryh charming. I was asked to try a peace of cheese. I felt guilty trying theier cheese without buying a peace, so I bought alarge piece of chees.e and ate it. It tasted strong and pungent. And it was giant. I then walked up the scenic hill which was nice, and saw the petit chapel, I small chapel on the hill. As I walked up, I could see the little houses. It was cold out, and it was a nice walk. I saw the sea with the star legend below me. I walked back to the town, and had lunch. I saw a pizzaeria and had a good pizza. Then after wandering around the small town some more, I walked back to the ship. Upon walking back, I encountered my friend Melissa, her mom, and a French foreign exchange student they had hosted in High School who they planned on meeting it advance, along with his Ukranian fiance. They invited me to sit with them, and Melissa's mom bought me a beer. He was a good looking guy my age, and she was an attractive 20 something blond. We talked for a while, and I mentioned that I was in the Ukraine the year before, when I did all my travelling. I talked about going to Chernobyl. After a while, we got on the tender back to the ship.